An irrevocable life insurance trust makes it possible for you to leave the proceeds of a life insurance policy to someone who is underaged or to someone who you are not confident can manage money responsible. Protecting a child or spendthrift heir is just one of many benefits associated with the creation of an irrevocable life insurance trust – there are also other reason to create this trust type as well. Clarity Legal Group can help you to understand the purpose of creating an irrevocable life insurance trust and can assist you in determining whether creating this type of trust should be a part of your estate plan. Out legal team will also guide you through the process of creating an enforceable trust that provides expected protections. Your life insurance policy should be able to provide strong protection for your loved ones, and with our help, you can make sure the proceeds of the insurance policy are used to protect and provide for the people you love most. Should I create an irrevocable life insurance trust? How can a Chapel Hill trust lawyer help me create an irrevocable life insurance trust? An irrevocable life insurance trust, or ILIT for short, is a trust that is created and that cannot be rescinded or altered after creation. Ownership of a life insurance policy can be transferred into the trust and the policy will no longer be owned by the insured person. When the insured person passes away, the trustee who was named when the trust was created is vested with the responsibility of managing the trust assets – the proceeds of the insurance policy – on behalf of designated beneficiaries. Should You Create an Irrevocable Life Insurance Trust? There are many benefits to creating an irrevocable life insurance trust. When the trust is structured correctly, all of the death benefits that are paid out to the trust from the policy will not be part of the insured person’s estate. This means that the proceeds of the life insurance policy do not count for determining if estate tax is owed and are not taxable if the deceased person had a large enough estate to trigger taxation after death. An irrevocable life insurance trust ensures that a trusted and responsible person is chosen to manage the proceeds of the life insurance policy. A minor cannot manage proceeds of a life insurance policy if he is under the age of 18 at the time when he inherits, and parents or others who leave funds to a minor may not want the young person to obtain full access to all of the available funds upon his or her 18th birthday. The creation of an irrevocable life insurance trust makes it possible for the insured person to dictate who will manage the money for the child so the assets are kept safe and used appropriately. This is also a benefit if the person who will inherit is an adult but who has money management issues that could put the proceeds of the life insurance policy at risk of being lost. Placing the proceeds of a life insurance policy into an irrevocable trust also protects the beneficiary of the trust in other ways. Because the proceeds of the policy are not considered to be owned by the beneficiary when an irrevocable life insurance trust is created, the assets should be safe if the trust beneficiary is sued or gets into serious debt with creditors. This means if you want to keep the proceeds of your life insurance policy safe not only from estate tax but also from potentially irresponsible behavior of your heirs or beneficiaries, the creation of an irrevocable life insurance trust could be a good option for you. How can a Chapel Hill Trust Lawyer Help Create an Irrevocable Life Insurance Trust? 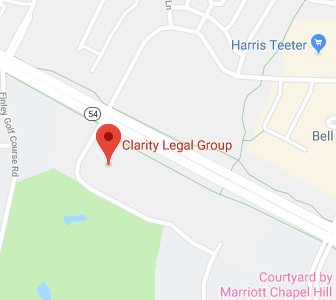 A Chapel Hill Trust Lawyer in Clarity Legal Group will help you to determine if you should create an irrevocable life insurance trust, based on the specifics of your situation including the special needs of heirs or beneficiaries. We can also provide step-by-step assistance and advice with the trust creation process so you can ensure that your irrevocable life insurance trust is legally valid and provides the expected protections. To find out more about how we can help you, give us a call at 919-484-0012 or contact us online today.